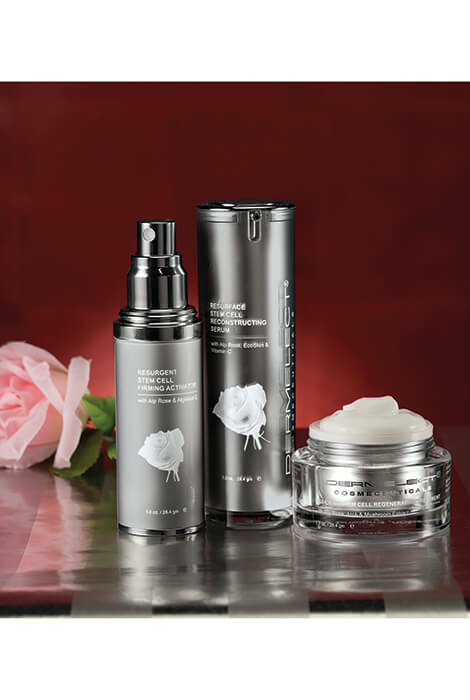 Renew your skin with the power of the Swiss Alpine Rose plant, a natural wonder that flourishes even in the harshest conditions. This anti-aging cream, formulated with stem cells harvested from the incredible plant, turns back the clock on your skin. Skin tissue stem cells are supposed to continuously regenerate new skin, but their function declines as we age due to environmental damage and natural aging. Resilient Stem Cell Regenerating Treatment counteracts this by stimulating new skin from the stem cell reservoirs, promoting denser, more elastic skin. The rich, creamy formula contains AHA, which boosts epidermal regeneration and reverses free radical damage, and mushroom extract, which leaves skin looking rested and supple. The result is softer, smoother, younger-looking skin. In a 17-day study, wrinkles were 45% less visible and complexion was 54% more radiant. 1 fl. oz. Apply a thin layer to the face in a gentle circular motion- twice daily (AM/PM). 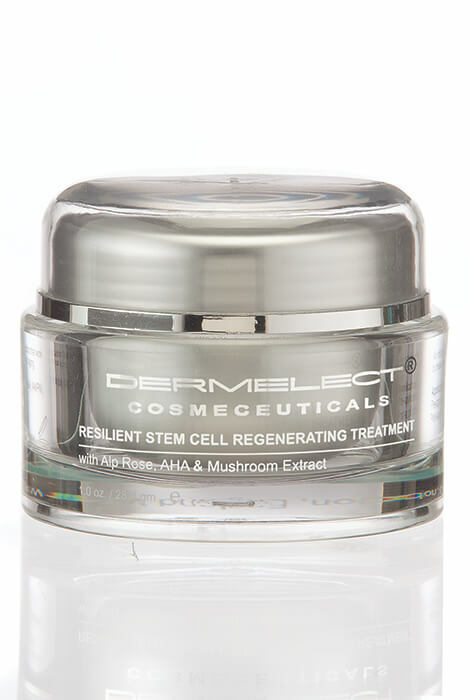 Post-application: Dermelect Resilient Stem Cell Regenerating Treatment followed by the Dermelect Resurgent Stem Cell Firming Activator. AQUA (WATER), ALOE BARBADENSIS LEAF JUICE, CYCLOPENTASILOXANE, CETYL ALCOHOL, GLYCERYL STEARATE, DIMETHICONE, GLYCERYL STEARATE CITRATE, CETEARYL ALCOHOL, CAMELLIA SINENSIS (GREEN TEA) LEAF EXTRACT, SODIUM HYALURONATE, SQUALANE, SODIUM PCA, BETAINE, SORBITOL, GLYCINE, ALANINE, MAGNESIUM ASCORBYL PHOSPHATE, PROLINE, SERINE, THREONINE, ARGININE, LYSINE, GLUTAMIC ACID, GLYCERYL CAPRYLATE, GANODERMA LUCIDUM (MUSHROOM) EXTRACT, RHODODENDRON FERRUGINEUM LEAF CELL CULTURE EXTRACT, ACRYLATES/C10-30 ALKYL ACRYLATE CROSSPOLYMER, ISOMALT, LECITHIN, SODIUM BENZOATE, LACTIC ACID, PROPANEDIOL, PHENOXYETHANOL, CARBOMER, ETHYLHEXYLGLYCERIN, SODIUM HYDROXIDE, TOCOPHEROL ACETATE, ROSA DAMASCENA (ROSE) OIL.